1) Absence of trust. If the members of the team do not trust each other then they cannot be totally honest with each other. 2) Fear of conflict. Without trust people will not have the healthy debates that are necessary to arrive at better thought through decisions. 3) Lack of commitment. If the team have not aligned behind a decision then the individual members who did not agree with the final decision will ultimately be less committed to that decision. 4) Avoidance of accountability. If they are not committed to the course of action, then they are less likely to feel accountable (or hold other people accountable). 5) Inattention to results. Consequently, they are less likely to care about the group results (and instead focus on achieving their own goals). The book is written up as a fable, following an artificial company through the five stages. It’s easy to spot the errors of a team but much harder to correct. In that sense the book is hardly revealing (I guess most of us knew many of these anyway). For me the biggest gap is in not providing enough tangible approaches and techniques that a facilitator or leader could use to address the situation. This entry was posted in Decision making, Leadership, Management, Team building, The power of great relationships, Transformational teams. Bookmark the permalink. 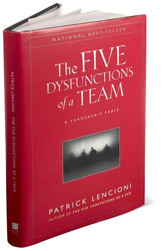 This book is biased towards the team members. It doesn’t address inadequacies of management and the message is really dangerous to members of the team if theses inadequacies are not dealt with first. Appreciation to my father who told me on the topic of this web site, this website is in fact amazing. yet effective. A lot of times it’s hard to get that “perfect balance” between user friendliness and visual appeal.